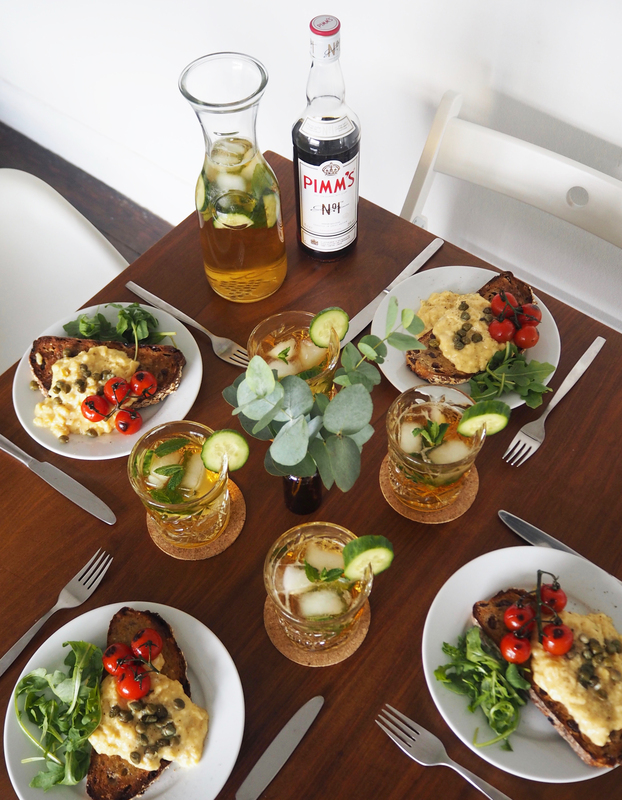 Pimm’s is the perfect summer drink, and what better than to share it with friends over brunch? Last weekend we had a couple of our nearest and dearest stay with us, and so we rustled up a tasty scrambled eggs and goats cheese dish for a late breakfast/early lunch (recipe coming to the blog next week). 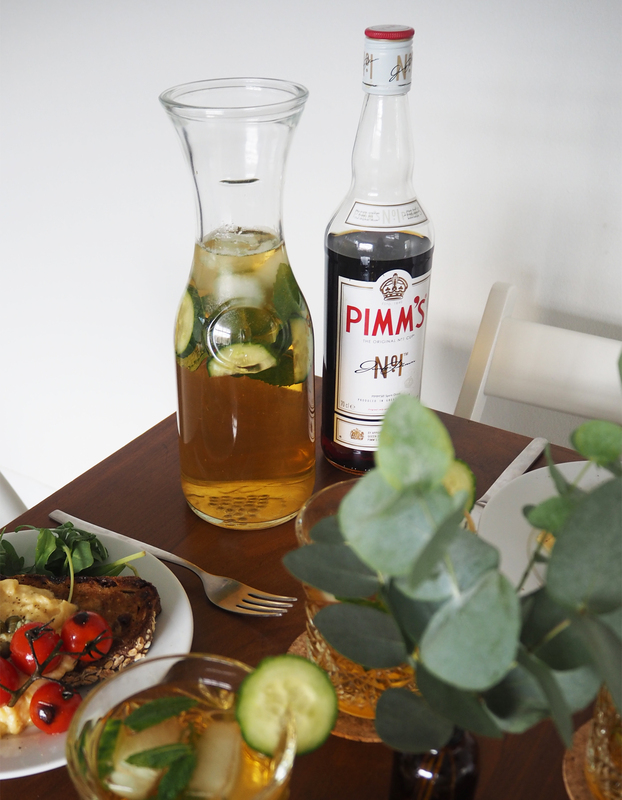 To accompany our rather colourful meal, I chose to whip up this light and refreshing Pimm’s cocktail recipe. Pimm’s and Proper is a summer take on a classic gin and tonic, with the addition of Pimm’s No. 1, cucumber and mint. Gin and tonic happens to be one of our favourite tipples, and so this deliciously light and fragrant cocktail was just what we needed to start the day. Served in a large carafe, we got our best cut glass tumblers out for the occasion, and I finished the cocktail with a garnish of cucumber on the side, plus an extra sprig of mint floating on top. Everyone agreed that the Pimm’s and Proper was a refreshing alternative to the classic Pimm’s Original, which is most commonly served with lemonade and garnished with strawberries, mint, orange and cucumber. This gin version was a lot less sweet than the Pimm’s Original, and I feel this made it compliment our brunch recipe better. Begin by filling a tumbler glass with ice cubes (3-4 should do it). Add 25ml Pimm’s and 25ml gin. Add 3 slices of cucumber and 1 sprig of mint. (Tip: Smack the mint leaves between your palms to release their flavour). 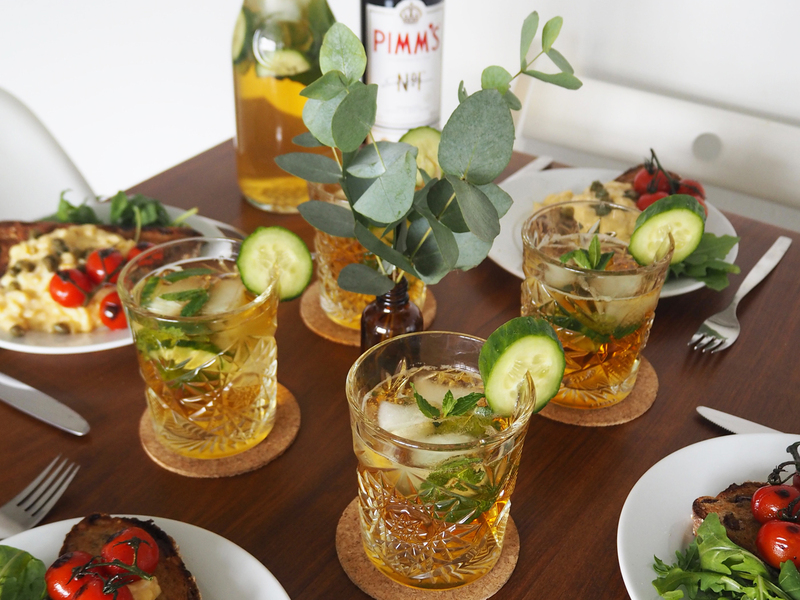 Are you a fan of Pimm’s? 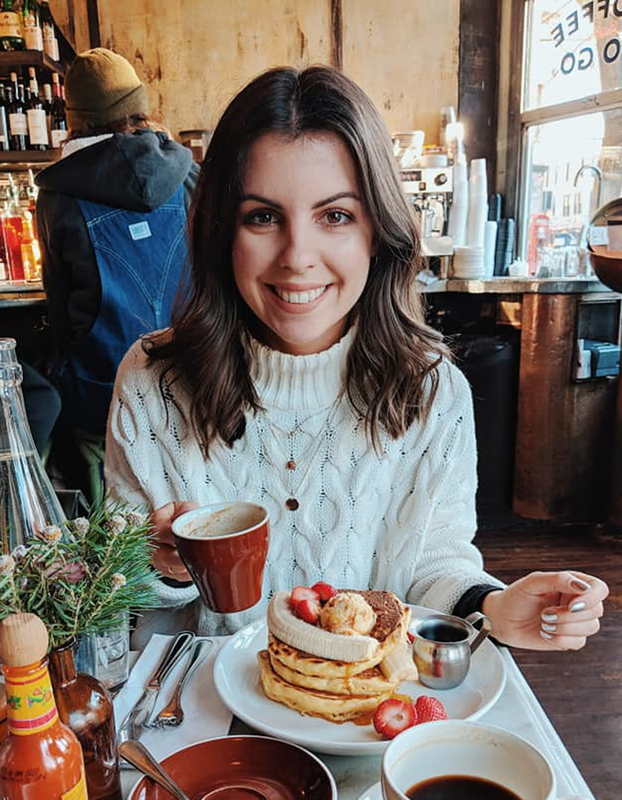 Will you be re-creating this brunch cocktail recipe? 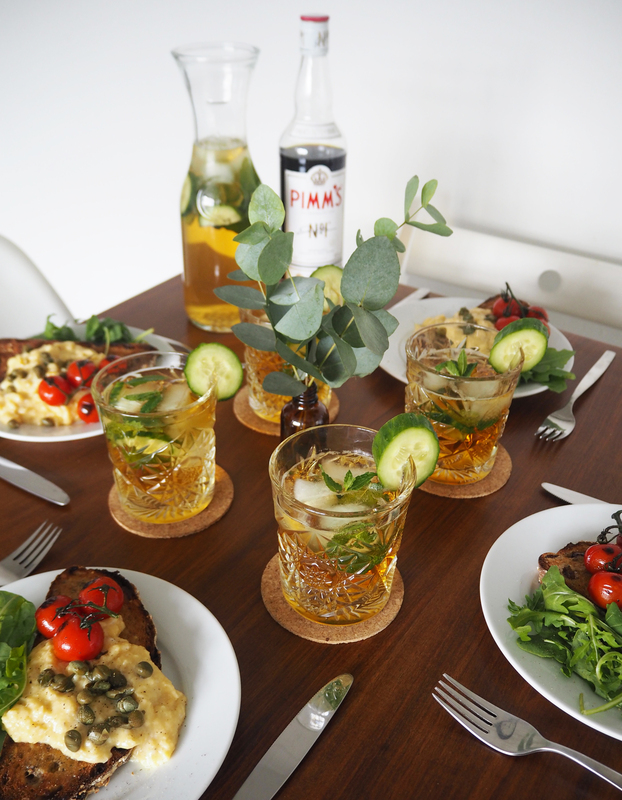 I absolutely love Pimm’s and am always looking for new ways of adding Pimm’s to my summer beverages. If you have any other recipes, similar to this one, I would love to hear them. 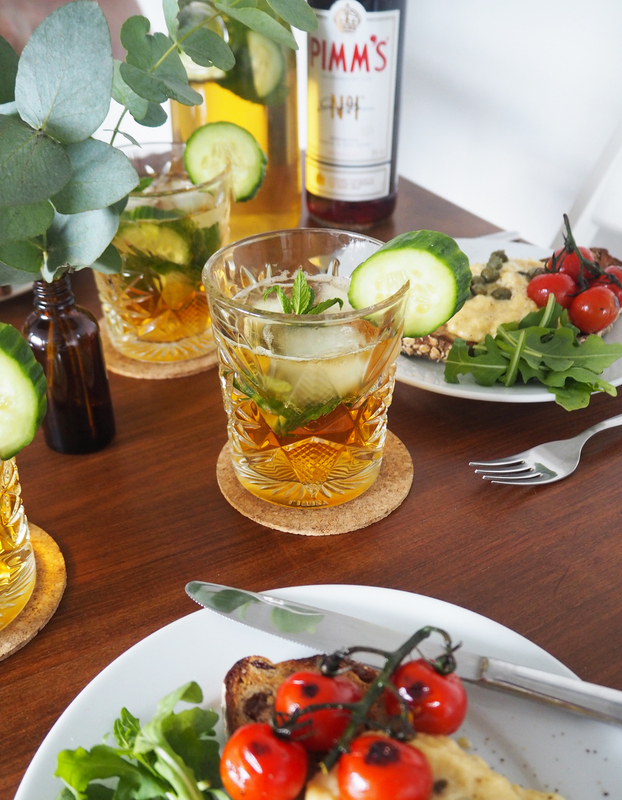 Whilst gin is my go-to spirit, I also enjoy rum and have a feeling Pimm’s could go well with a little rum and ginger beer. I’ll have to try it next time and I’ll let you know how I get on.